The typical modern diet includes chemicals from trace pesticides, additives and preservatives. Proponents of cleansing claim that severely restricting food intake flushes the body of these dangerous toxins. A 48-hour water diet involves drinking only fluids to cleanse the body and quickly lose weight. Talk to your doctor before beginning a water diet, because it can be bad for your health. The central purpose of a water diet is to cleanse your body and allow it to heal. Cleansing proponents claim that a water diet gives your digestive system a break by eliminating solid food intake. According to Dr. Ben Kim's website, a water fast promotes quick rebuilding of the mucosal lining of the intestines. Fasting also allows cells to eliminate waste products and neutralize dangerous toxins. Before beginning a water fast, slowly decrease your intake of sugary and processed foods. Quickly switching from a high-fat, unhealthy diet to exclusive water consumption may cause headaches and excessive cravings. The website Fitness Through Fasting recommends drinking at least ½ gallon of water each day of the fast. No other foods may be eaten. Choose purified water over tap water, which often contains trace minerals and metals. 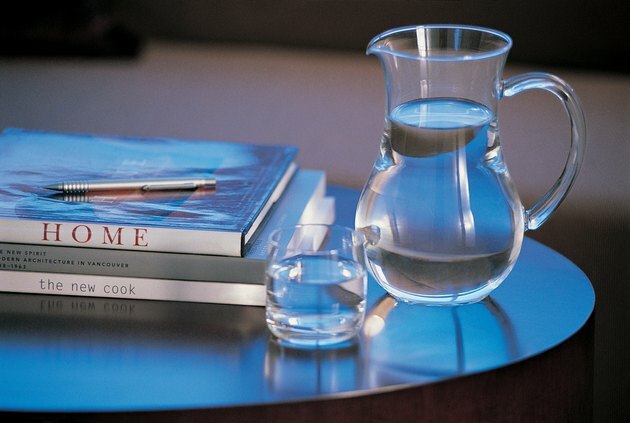 A 48-hour water fast may be too difficult for beginning dieters. If you have not completed a water fast before, try drinking water exclusively for 24 hours. After successfully completing one or more 24-hour fasts, a longer fast is acceptable. Be careful not to binge after the completion of the water fast, as this often causes gastrointestinal distress. One of the most striking benefits of a 48-hour water fast is rapid weight loss. Your body sheds pounds by eliminating excess waste from the digestive tract and burning fat stores. Weight loss of 3 or 4 lb. is typical, according to Fitness Through Fasting. Dr. Ben Kim reports that a water fast boosts energy levels, promotes clear skin, improves cardiovascular functioning, relieves anxiety, regulates digestive activity and decreases body pains. A 48-hour water fast may be dangerous for your health. Your body receives no nutrients during a water fast, which can slow metabolic processes. MayoClinic.com reports that rapid weight loss from extreme diets often occurs because your body sheds water weight or lean tissue. Gradual weight loss through diet change and exercise may be a better solution over the long term. Talk to your doctor before beginning a water diet to make sure it is a healthy choice for you.